The campus of Princeton University has been designed to produce an impression of timelessness. The collegiate Gothic buildings, which resemble 16th century buildings at Oxford, might belong to the late 19th century — or to the 21st, like Whitman College, a lavishly beautiful Gothic ensemble named for the eBay magnate and built in 2007. To obscure Whitman College’s newness, Princeton planted full-sized trees next to the buildings. To hide the age of other buildings, a small army of repair crews descends upon the campus every summer, to head off any possible sign of decay. And yet they strive never to make anything look refurbished: everything is carefully left to appear as it was. The leaves color and fall in autumn, snow piles up and melts, spring grows into summer: but the buildings appear immune to time’s vicissitude. In old pictures, the students and their fashions come and go like the changing apparel of nature, but the buildings, the physical manifestation of the university, do not change. Princeton’s Latin 110 course might appear to be more evidence of this changelessness. If you pass by its open door before class begins, you will hear students laughing and joking — in Latin, the language so associated with student life that it gave its name to Paris’s “Latin Quarter,” home of the Sorbonne. When the instructor arrives, he lectures to students solely in Latin, the language of Cicero’s orations and quondam Oxford dons. Student work is submitted daily — exclusively in the language of Horace and Vergil. The impression is of cultural continuity, another example of Princeton’s enduring character. But this obscures the innovative spirit behind the course. LAT 110, offered for the first time in fall 2018, is almost certainly the first course at Princeton ever taught entirely in Latin. And it has happened not because of some madcap eccentric professor, but due to undergraduate demand. Students calling for instruction to be conducted in Latin — and getting it, no less — struck me as something new and unexpected. I thought it was worth a trip to Princeton to investigate. 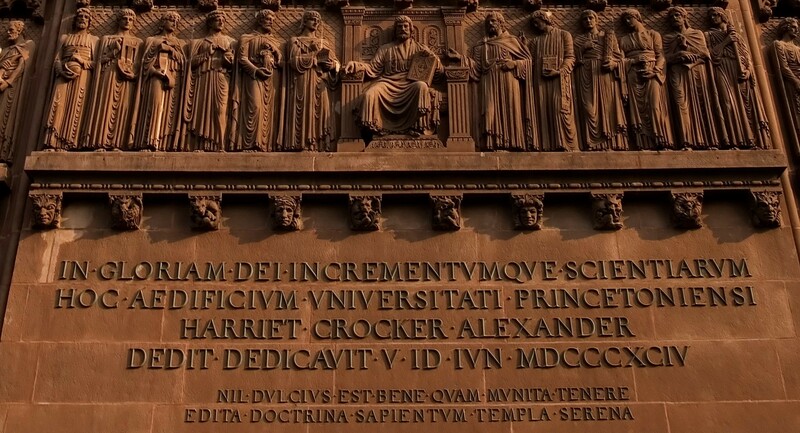 On the Princeton campus: the Latin inscription (with verses from Lucretius) on the facade of Alexander Hall. The number of students studying the Humanities at Princeton, as at most American universities, is in decline. Princeton’s Humanities enrollments are double the national average (24% as opposed to 12%), but that number has declined by a quarter in the last decade, prompting the university in 2015 to commission a “Task Force on the Future of the Humanities.” The task force’s recommendations — more or less “build a new building and allow for double-majoring” — probably will not solve the problem, which is larger and cultural: all Humanities programs are more or less in crisis in a practical age seeking dollar-quantifiable returns. Classics departments face an additional obstacle: the legendary difficulty of Latin and Greek. The problem is not new: the French essayist Michel de Montaigne, himself a brilliant Classicist, complained that “Latin and Greek no doubt are very great ornaments, and of very great use; but the cost to acquire them is too high.” That was in 1580. Students are still complaining about their declensions and conjugations and all the inflected paraphernalia of a Classical education. But a pair of Princeton students, Kevin Duraiswamy and Gabriel Parlin from the class of 2019, realized there was another way to learn the language. Duraiswamy had been following the world’s most proficient Latinists, to learn their secrets. Parlin found the keys to language acquisition while studying German and Russian. Working together, they felt they could speed up the language acquisition process for Latin and Greek — reducing the “cost to acquire them,” and thereby perhaps opening them up to a new group of students, even in the age of the dollar-quantifiable return. Exasperated by his lack of progress, Duraiswamy turned to the internet, where he found stories of people who had mastered Latin only after they began to treat it as a language: something to be heard, written, and spoken. In particular, he found the online lectures of the Italian Latinist Luigi Miraglia, widely considered the greatest living Latin speaker. (Miraglia is worth a whole essay himself: he began speaking Latin as a teenager, when he was taken to live on an island in the Bay of Naples with an older man who spoke Latin and Greek every day). Despite six and a half years of Latin, Duraiswamy couldn’t understand Miraglia when he lectured — but he could tell that his audience could. He began attending Princeton’s Latin table, though it was often only himself and one other person. He found Daniel Pettersson’s website Latinitium, which features an array of online resources for people trying to gain Latin fluency. He began following the work of Justin Slocum Bailey, a fluent Latinist and gifted teacher who runs a company called Indwelling Language. He then heard about the Paideia Institute’s Living Latin in Rome program, a study abroad program with a significant spoken-Latin component. He applied and was accepted. Once in Rome, Duraiswamy was exposed to a world of people who could speak and read Latin fluently, and his own Latin began to quickly improve. He decided to take a year off from Princeton, and applied for Miraglia’s own tuition-free, residential academy outside Rome, called the Vivarium Novum, where students speak only Latin (or ancient Greek). He was rejected (I can’t say why, but Miraglia does not seem to look for the same thing in students that the Ivy League does). Duraiswamy decided to remain in Italy, taking Italian language courses and meeting regularly with Paideia staffers working in Rome. By the end of the year, he was a fluent reader and speaker of Latin. Gabriel Parlin is a good friend of Duraiswamy, and the two make an odd, engaging pair. Parlin carries with him the air of a person not entirely at home in this world. Bespectacled, bookish, and brilliant, he speaks in perfectly formed critical appraisals of the things around him. He credits excellent teachers in high school and college for the fact that he now reads Dostoevsky in Russian and Goethe in German. But he found himself stalling in Greek class, and he came to the conclusion that he needed to read more easy texts before starting on difficult ancient literature. He was recapitulating an insight of language acquisition theorists known as “comprehensible input:” language learners are better off reading lots of picture books and fairy tales before they try to tackle Milton or Aeschylus. As we envision it, the course would meet 5 times a week and would be conducted entirely in Latin. During class, students would do various activities to exercise the faculties of speaking and listening. Such activities might include paraphrasing and explaining easy texts, listening to stories and responding to questions about them, and discussing aspects of ancient history and culture…. Homework would emphasize the other two faculties of language, writing and reading. Writing assignments would differ from those of a traditional prose composition class in two ways. First, all assignments would be free composition in Latin rather than translation from English to Latin. Second, rather than composing small pieces of complex prose, students would write large amounts of easy prose…. The reading assignments would also differ from those of a standard reading course. Normally, students are required to read short selections of very difficult texts. In this course, following the advice of language pedagogy experts, students would read large amounts of easy texts of which they could read 10–15 pages an hour. Per week, therefore, we imagine that students would read at least 40–50 pages of Latin, if not more. Among the texts that we would recommend for this type of extensive reading are Hans Orberg’s Lingua Latina Per Se Illustrata series, graded Latin readers, and possibly, if students make enough progress, easier ancient texts such as Eutropius, Hyginus, Florus, and Nepos. I was impressed by their thoughtfulness about the contributions of this mode of learning Latin, and especially by the strong interest they were able to attest from their fellow students. That really is crucial for us: if we are going to try to implement a new initiative like this we need to know that it will enroll enough students, which this one certainly has. Feldherr took the proposal to the Office of the Dean of the College, which promised to provide funding for an additional course. Most of the news in the Humanities is bad, but this is the good side of any crisis: there is strong incentive to adapt. And with any adaptation comes at least the potential for renewal. Robertson Hall, where LAT 110 meets, is a modern building designed by Minoru Yamasaki, the architect of the World Trade Center. It still manages, though, to fit into the Princeton mold of timelessness — built in 1965, it looks like it might just as easily have been built in 2005. Down in the basement, in a long room with a row of white boards on one side and glass wall on the other, I found a few students seated around a long central table. They were laughing and joking and engaging in chit-chat — all in Latin. The meeting came to order when the teacher, Joseph Conlon, a recent Ph.D. from Princeton’s own graduate program in Classics, walked in the door. A handsome, fit young man with dark hair and a smattering of stubble across his face, Conlon’s appearance indicates that spoken Latin remains largely a youth movement. Possessed of a quiet confidence that reads in the classroom as demanding charisma, Conlon had promised in the LAT 110 course description that “by the end of the course, you will be reading Latin literature with ease and fluency.” This seemed a rash boast, and I was curious to watch his technique. Conlon began by calling up one student to speak on a topic of the student’s choice — an exercise called an oratio. A junior named Andre stood up and told a story of his childhood: he and his brothers went for a hike. They found a frog, captured it, and after some arguing about bringing it home and making it a pet, decided to set it free. Andre’s brother threw the frog into the pond, but before it even hit the water a large fish leaped out of the water and swallowed it whole. The story was narrated very impressively, in comfortable, idiomatic Latin. The other students then asked questions, centering — with Conlon’s guidance — on the ethical implications of the story: si ramam domum attulisset, vixisset — if he had just taken the frog home, it would have lived. Ergo culpa eius mortua est. So it was his fault that the frog died. The students enjoyed this banter. And I was impressed: every student except one seemed possessed of real aural and oral fluency. Shortly thereafter, I could see why Conlon had steered the conversation as he had: the topic of the day was conditional sentences. Conlon modeled some on the screen, and then created a chain exercise: the first student said, “If we learn Latin, we will become wiser.” The next followed, “If we become wiser… we may be happier.” “If we are happier, …” and so forth. Then Conlon put a set of four images on the screen, the highlights of the Aesopian “Country Mouse and City Mouse” fable found in Horace. Students broke up into pairs and discussed what they saw in each image, an exercise he called ecphrasis (Greek for “description”). After completing rather exhaustive descriptions, they moved into a contio: a debate about which was better, city life or country life. Prior to the debates, Conlon presented students with a set of plausible arguments pro and con, to model vocabulary and locutions. After debating with each other, students delivered their best arguments to the whole class. Class was at an end, and students went their way happily. In many ways it was like any other language class: students learning French or Persian might have seen the same mixture of presentation, grammar explication, pair work, and sharing with the group. But the classroom elements were also classical: oratio, ecphrasis, and contio have all been part of the Classics classroom for at least 2000 years. Conlon had created a class experience that conformed to the basic principles of modern language instruction — hearing and speaking in varied contexts — within a specifically Classical framework. And perhaps most importantly, the atmosphere felt different from most university courses: there was a palpable air of excitement in the room. And joy. Conlon added Latin and Russian to his Greek studies while in college. But troubles began: “After one year of Russian, I could read Dostoevsky or Tolstoy far better than I could read Latin or Greek after three years.” He had no answers until he attended the University of Kentucky’s Conventiculum program — a spoken-Latin gathering which takes place every summer. “I realized there finally that there was another way.” He has since then been applying modern-language acquisition techniques to the study of Latin and Greek. As the example of Rankin shows, language instruction is amenable to obsessive optimization strategies. And the young Conlon is an obsessive optimizer. In fact, Rankin may be an exemplar for Classics in other ways. Language departments typically focus on both language and literature, creating a natural split: Proust professors generally have about as much interest in explaining irregular French verbs to undergraduates as Woolf scholars have in teaching ESL courses. And yet language departments, often quite small, desperately need to reach and train new students. The solution has been to hire language instructors, sometimes (as at Princeton) under the umbrella of a “language center,” generally in non-tenure-track positions. Rankin is an example. Whether spoken Latin courses like Latin 110 will help Latin’s plight on college campuses remains to be seen. A lot depends on the success of the course: if Princeton students clamor for more, it certainly has a chance. Meanwhile, other initiatives are occurring elsewhere: USC is offering a “Living Latin” course, CLA 490, taught in Latin by a graduate student named Tyler Patterson. Cornell has brought on a spoken Latin expert, Daniel Gallagher, whose previous job was translating and writing in Latin for the pope. The University of Kentucky, spearheaded by Terence Tunberg and Milena Minkova, has been teaching graduate courses in Latin for decades. Professors such as James Dobreff, Diane Warne Anderson, and Peter Barrios-Lech have made University of Massachusetts at Boston a hub for spoken Latin, and under the leadership of Jacqueline Carlon its MA programs have been working to provide an entire generation of Latin teachers with these kind of pedagogical skills. And smaller colleges like Wyoming Catholic College and Belmont Abbey College, where Nancy Llewellyn teaches, have moved wholeheartedly to spoken Latin programs. One thing I found out for sure by visiting Princeton: students still arrive from time to time with a thirst to drink from the springs of antiquity. I feel confident that as long as this is the case, someone will figure out how to draw the water up from these wells. John Byron Kuhner is the former president of SALVI and editor of In Medias Res. A magazine for lovers of the Classics, published by the Paideia Institute.